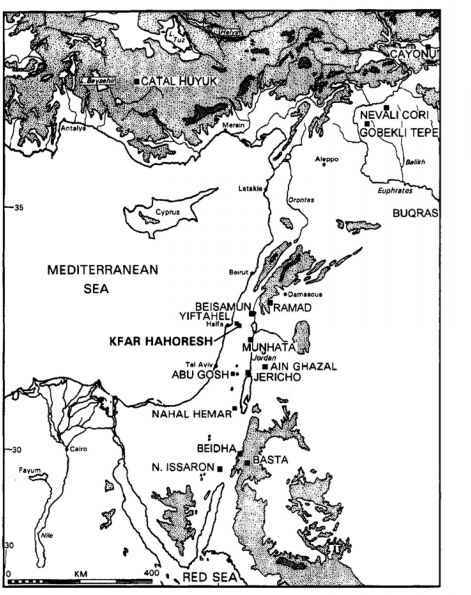 In comparison to the PPNA, archaeological excavation and survey of PPNB settlements of the Near East have furnished a much more deiailed understanding of a clear overall demographic increase, the appearance of more numerous villages, and the expansion of communities into new regions such as Anatolia. On the symbolic level, female representations continued to dominate, but a few explicitly masculine anthropomorphic figurines also appeared, and the theme of the bull spread throughout the Near East (Levant and eastern Anatolia). Other artistic and funerary phenomena, discussed later, enrich our understanding of the religious data. In addition to architectural, technological, and economic data, consideration of the PPNB illustrates the utility and importance of symbolic data in addressing the mental structures of a period and outlines that a profound unity of thought underlies in reality all the manifestations of PPNB culture from the most spontaneous to the most utilitarian. Despite local variations the cultural tradition of the PPNB comprises from beginning to end a definite number of stable features, some of which had their origin in the end of the PPNA of the Euphrates. Besides the symbols of the woman and the bull, there is rectangular architecture and flint knapping on bipolar nuclei (naviform) to produce fine regular blades; these blades were intended particularly for arms (projectile points and daggers) of which the quantitative importance and the aesthetic are already perceptible in the earlier Mureybetian. Other features appeared only in the PPNB: the use of a flat lamellar retouch on flint or obsidian blades gives rise to a specific weapons typology (Byblos points and Amuq points). These weapons rise in number and quality, suggesting that they were prestigious items in these communities. While the use of domesticated plants and agriculture spread throughout the Near East by the start of the PPNB, the beginnings of animal domestication occurred only in the middle PPNB, about 10,000 bp. The first do mesticated animal was the goat, simultaneously in the northern and in the southern Levant. It was followed in the late PPNB (about 9,500 bp) by sheep, then at the end of the eighth millennium by cattle and pigs (Helmer 1992). About 9,000 BP, humans had completed their mastery over the main food animals; among these the domestication of the sheep in the late PPNB led to pastoral nomadism, which gave to certain human groups a new freedom of movement (Cauvin 1980; Stordeur 1993). Another important feature to keep in mind is the speed and encompassing nature by which the PPNB expanded into other regions of the Near East. From the late PPNB, perhaps even from the end of the Late Mureybetian that gave rise to it, southeast Anatolia (Cayonu, Cafer Hoyuk, Nevali Cori) became Neolithic, with the appearance of the "PPNBof the Taurus"(Cauvin 1988), which combined local elements to the main features of the PPNB as a whole, including agriculture, rectangular houses, importance of arms, cult of the goddess and of the bull, and, later, animal domestication. As discovered by Kenyon (1957), it is in the Middle PPNB that Palestine was quickly taken over by PPNB population from the north. It is, moreover, during the late PPNB that there occurs the "great exodus"when Neolithic occupation with pastoral nomadism takes place in zones peripheral to the central area of the Levant, such as western Syria and Lebanon, northern Iraq (Magzalia), and the semidesert zones of the Levant (the Syrian, Jordanian, and Sinai deserts). While these regional cultures are distinct facies of the PPNB, the general traits of this culture are maintained, with the exception of the round houses characteristic of the nomadic PPNB. I have suggested elsewhere that these diverse cultural or economic domains should not be looked on as so many separate "chapters" without relation to each other, but that they were in fact "homologous" in the sense of Levi-Strauss. That is, they all presented on various planes of reality a single mental structure, directly intelligible at the level of religious symbolism. In this symbolism there is evidence of the beginning of an ascendancy of male artistic representations, such as the masculine figurines at Mureybet IV, at Cafer Hoyuk (Cauvin 1989:Figure 11), and in Palestine at Munhata, with ithyphallic figures (Perrot 1966b). Bull figurines especially spread everywhere from the Taurus to the Dead Sea. A particularly expressive example is that of'Ain Ghazal (Rollefson 19831, where zoomorphic figurines are abundant and, at times, found with a bladelet of flint stuck in the head or chest, a motif that could be an early allusion to the bullfighting theme found in the painted frescoes of the seventh millennium at Catal Hoyuk and in the eastern Mediterranean of the Bronze Age. There also appears to be a relationship between this ascendancy of masculine symbols and the broader patterns of PPNB material culture previously discussed. The angularity of PPNB residential architecture, for ex ample, where the straight line dominates, contrasts with the matrix-like roundness of the pithouses of the Natufian-PPNA tradition. The abundance of arms and the aesthetic perfection of certain specimens do not appear to be linked to any new need; on the contrary, at this period hunting gives way to more peaceful herding; this could only indicate a "love of arms" as a social value with virile significance. It is also important to note that the origins of animal domestication to not appear to be linked to securing reliable meat resources. Following Legge, Helmer (1992) has shown that animal domestication at Middle PPNB Abu Hureyra with the first modifications in size of domesticated animals concerns only a small number of animals of limited food importance, and does not become a vital economic factor until the Late PPNB. Digard argues within present-day ethnographic cases that "the stupefying domesticating zeal of man" doubtless had as an end simply "humandomination over creatures and things" (Digard 1990:215). Contrary to the traditional conceptions, pastoral economies are the practical and already secularized result of a confrontation of man with the animal kingdom, at first lived in a mythic and ritual form. The bull was felt to be the most expressive symbol of this irrational and sometimes destructive power of wild nature, to master in order to be truly "a man." This primordial confrontation could be represented by the bull-man combat, which goes back to the Neolithic and is maintained in present-day in Spain due to the persistent wildness of uncastrated bovine males. It is present at £atal Hoyuk where cattle were, according to the archaeozoologists, in the process of being domesticated, whereas the PPNB of 'Ain Ghazal had mastered only sheep and goats, obviously more easily approachable than wild cattle. This interpretation certainly requires on our part a certain "empathy" (Colingwood), in accordance with contextual archaeology, but it is not arbitrary. The only license the prehistorian has here, in order to understand Neolithic symbolic system and imagery, is to incorporate models based on later and literary civilizations, such as those furnished by the Bronze Age civilizations occurring in the same cultural area in conjunction with the same images. We have evoked the formal identity, already noted by Mellaart, between the masculine figure at £atal Hoyuk riding a bull and the Phoenician Hadad. Similarly, the "Baal" ofUgarit, described as riding the heavenly bull, is viewed as symbolizing the storm and war (his destructive power), but he is also the master of cultivated fields and the civilizing hero (Caquot et al. 1974). This dialectic relationship, previously illustrated by the bullfighting image, exists between the raging force and controlled virility, between "bestial" violence (outside man or within him) and the hero's mastery. It is also, collectively, the passage from nature to culture. The earliest history of this symbolism teaches us that the great civilizing changes of the Neolithic were at first anticipated and played out within religious and ritual contexts and that only then men themselves achieved that which was first attributed to the gods. Where are social structures situated in this sequence? Funeral rites provide precious information for this question, but so far most archaeologists have felt at ease only when addressing dimensions of social hierarchy and the emergence of social differentiation. Burials and the richness of their offerings, for example, are a highly visible means by which inequalities are expressed. Inequality occurs among all human groups for natural abilities are never divided evenly. For the most part, however, archaeologists have been more concerned with institutional inequality—something that only emerges at the end of the Near Eastern Neolithic when social differentiation in urban civilizations is foreshadowed. Nevertheless, study of burials, sacred places and mortuary ceremonies in the egalitarian Pre-Pottery Neolithic provides a rich source of information for understanding existing social organization. It is to be recalled that for Gordon Childe the "temple" and the "palace" were the principal indicators of urbanization. Interestingly, recent archaeological research has demonstrated that by the PPNB—that is, long before this urbanization—exceptional nonresidential buildings existed, buildings that probably served as sanctuaries constructed for religious use. These are seen from the early PPNB at Cayonu (Ozdogan and Ozdogan 1990) and at Nevali Cori (Hauptmann 1988) in Anatolia, to which should probably be added a large Middle PPNB building at Beidha in Jordan (Kirkbride 1966). The sanctuary of Cayonu contains an enormous concentration of burials and human skulls (more than 400 individuals), which make it a veritable "House ofthe Dead." Although different, one structure atNevali Cori has in its center a large stone stele, roughly anthropomorphic in design. The three sanctuaries each have a large quadrangular stone slab; that of Cayonu was discovered by microbiologists to have traces of blood on its surface (Ozbek 1988), which would apparently indicate its use as a sacrificial stone. These sanctuaries were, then, places of assembly and religion. We should compare the many lime plaster statues found in Palestine atJericho and 'Ain Ghazal and the stone masks found in the south Levant in several places, in particular at Nahal Hemar (Bar-Yosef 1985). The statues are light and flat, obviously intended to be carried or exhibited; like the masks and the sanctuaries themselves, they indicate a socially organized religious life, with ceremonies that were probably recurring and directed by a few charismatic individuals rather than a true clergy. Examination of the architectural context of these villages provides no evidence for "palaces," the more secular version of exceptional buildings. The residential structures remain homogenous, without discontinuities in size suggesting social divisions. The fact that the first exceptional constructions were religious buildings is thus significant. The PPNA tower of Jericho, for example, was already an excep tional construction the role of which was probably more symbolic than defensive, as demonstrated by its last reuse as a collective burial place. But it was not, however, a place of assembly. The great sanctuaries of the PPNB introduce for the first time architectural evidence for the possibility of organized secular and religious meetings. Consideration of the evolution of Near Eastern Neolithic funerary customs, and specifically the "cult of skulls," illustrates that these played a fundamental role in structuring broader social life itself. It first appears in the PPNA in the custom of burying human skulls separately from the bodies, as for example at Jericho (Kenyon 1957:72) and in more recent discoveries at Cheikh Hassan (Cauvin 1980) and Jerf el Ahmar. This is not only an indicator of secondary burial but also of a marked preference for the head in the evocation of the reburied dead. In the same way, I argue elsewhere (Cauvin 1987:1478) that, contrarytothe Paleolithic "Venuses," from the PPNB onward anthropomorphic figures of the Near East more often emphasized the head and the eyes, often painted or represented by clay globules or shells. The eyes and their expression evoke that which is most subjective and specifically psychic in the human being. In the case of the figures of the goddess, it is her power of fascination that is probably indicated by the emphasis on the eyes. Two facts appear particularly significant when considering the PPNB "cult of skulls" (see Bienert 1991; Kuijt 1995). The first concerns their location: accurate observations of excavations have shown that the skulls were possibly not buried, but stored in cells or fabricated containers (for example at Cayonu or Ramad) or discovered in situ on the very floor of the houses (and not beneath), as for example at Mureybet IV. At Mureybet, they were placed on clay supports, which probably also existed, roughly anthropomorphic, at Ramad (Contenson 1992). In other words, these are a kind of cult object intended to be visible (continuously, or intermittently and ceremoniously if they were stored) to the living. This "object"aspect is confirmed by a second fact: this is the "artistic"application to which the skulls could be subject. For example, traces of paint remain on a skull from Abu Hureyra, and in most cases of lime-plaster modeling of skulls in the central and southern Levant extensive attempts were taken to reconstruct the face. One finds the same emphasis on the facial expression, through the use of painting or shells for the eyes, with the statues of Jericho or 'Ain Ghazal. The fact that the heads were preserved and kept in condition for viewing by the broader village community was a new phenomenon that contrasts to earlier simple funerary piety, in which the dead were buried in the earth, leaving their memory to become fragile. This indicates, in the sedentary communities of the PPNB, a carefully'maintained memory of ancestors through ritual ceremonies. Thus, there was an increased sense of human lineage, a strengthening of social links, and an affirmation of collective property in definite territories. This does not necessarily mean, however, that this ideology was only the outcome of a new organization of society. Although it is difficult to define which came first, it is more probable that we have two simultaneous sides —the one interior, the other exterior—of the same overall transformation of Near Eastern populations. The projection of the human image in religious art as well as in funeral practices unquestionably constitutes an important stage in the development of the self-consciousness of our species.